Want to learn how to find the efficiency of your amplifier? In this article we will tell you how to measure the efficiency of your amplifier with a couple simple tools. Most of the power taken in by an amplifier is converted into music, but there’s always a little loss, mostly in the form of heat. That’s why amplifiers have heat-sinks on them to help dissipate the heat. Let’s get started with a sequence of steps and you will ultimately figure out the efficiency of your car amplifier. 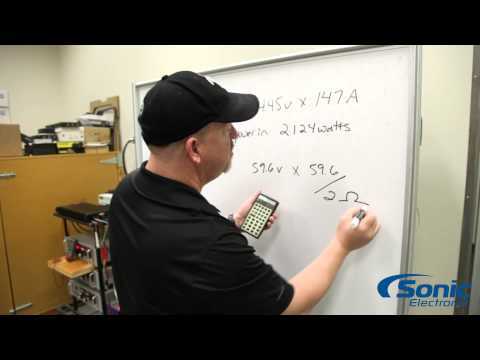 To determine the efficiency, you need know how to measure the input power of a device. Use the formula P=V*I. You can easily measure the voltage of the amplifier and the current coming into the amplifier using a multimeter or an oscilloscope. The product of voltage and current gives you the input power. Output power is the second important factor to calculate the efficiency of an amplifier. Take the formula P= V2/R, where V is the output voltage and R is the resistance. Simply take the square of speaker output voltages and divide it by the resistance (ohms). This will give you the output power. Using the final formulaEfficiency = Output Power/Input Power, you will be able to find the amp’s efficiency. Divide the output power by input power and the outcome will tell how efficient your amplifier is.